HOUSTON -- An 8-week-old puppy named Apollo who was rescued from a dog fighting scene has had life-saving surgery and is on the road to recovery. Apollo and his litter mates were used as bait in a dog fight. He survived, but his mother and siblings did not. According to a local animal advocate, someone near the dog fight rescued him. Apollo ended up in the care of Teresa Kobs. She has fostered dogs and cats for years. Kobs tells Eyewitness News that Apollo is out of surgery performed to close a hole in the roof of his mouth. The surgeon removed several teeth. Apollo will spend the weekend at the animal hospital receiving treatment. 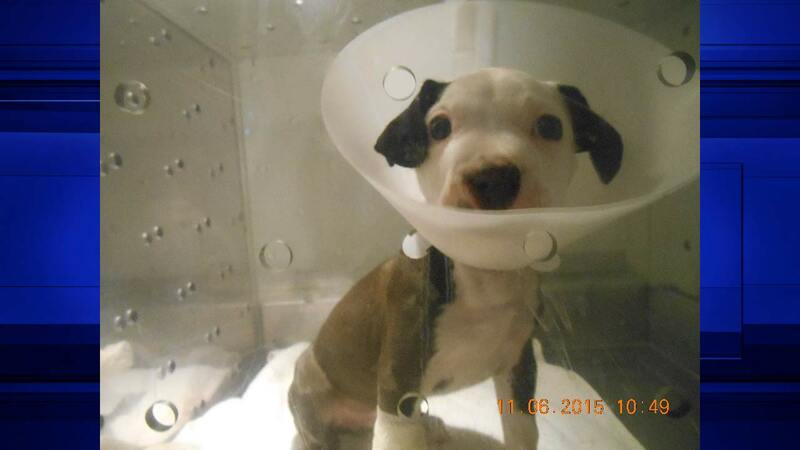 The puppy had two skull fractures as well. Kobs has increased the amount on a GoFundMe account because Apollo's medical bills will be higher than expected. Any excess money raised on the GoFundMe account will go to a local pit bull rescue.